Ground water flows slowly underground through pore spaces between sand, gravel, and cracks in rock, in underground formations called aquifers. These aquifers supply water that is used for sources for drinking water, agriculture, feeds our lakes, and recharges our streams and rivers. So as you can clearly see, having safe, clean groundwater matters to each and every one of us. Without it we will all face a high probability of disease and sickness because of the contaminants we would ingest by drinking water from polluted groundwater sources. Thirteen years ago the National Groundwater Association, an organization which has proven itself highly useful in bringing groundwater safety issues to people’s attention for many years, began National Groundwater Awareness Week as a way to generate interest in groundwater cleanliness and advocate private well testing. Without regular well water testing well owners will not know if the aquifer from which they obtain their water has become contaminated. While the list of potential contaminants would take forever and a day to complete, the most commonly found contaminants in groundwater include arsenic, nitrates, nitrites, coliform bacteria, and various metals such as lead, iron, copper, manganese, etc. Far too many private well owners put faith in notions such as “my well gets its water from the deepest part of the aquifer so I know it’s safe to drink” or “we have never had a problem before so we shouldn’t have one now” and potentially set themselves up for trouble. Contamination of aquifers does happen and it can occur without any clearly identifiable cause. It takes time for unwanted contaminants to work their way down through the soil and/or through vast mazes of underground waterways so a contaminant found today may have began its journey into the aquifer years ago. Well and groundwater professionals all pretty much agree that private wells should get tested for at LEAST coliform bacteria, nitrates/nitrites, arsenic, and dissolved heavy metals once a year — preferably by a certified drinking water testing laboratory. For a list qualified labs in your area, take a look at the State Certification Officers for Drinking Water Laboratories page on the EPA web site. It contains a list of links to certified labs arranged in alphabetical order by state. For those who would like to perform spot checks on the quality of the water produced by their well on their own, we suggest taking a look at the Well Driller Master Test Kit since it gives well owners the ability to test for many different parameters on more than one occasion. 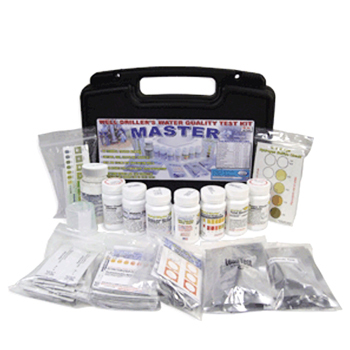 The Well Driller Master Test Kit comes with 50 Free Chlorine Test Strips, 50 Ultra Low Total Chlorine Test Strips, 50 Hydrogen Sulfide Tests, 50 Total Hardness Test Strips, 50 Nitrate/Nitrite Test Strips, 50 pH Test Strips, 24 Manganese Tests, 50 Water Metals Test Strips, 10 Arsenic Tests, 25 Iron Tests, 50 Copper Test Strips, 2 Lead in Water Tests, 2 Pesticide Tests, and 1 bottle of Bacteria Test. « Do You Sell Test Kits for Fluoride?